That was good! I enjoyed it and I'd love to see someone make more episodes. (Maybe I should buy the manga? It's successful enough to have been translated into English, but I can get the original volumes more cheaply on Amazon.co.jp. I think I will, actually. Natsuki would like it.) It's a gag comedy for children, but also surprisingly gleeful about detachable body parts, severed zombie heads, intestines used as ropes, etc. 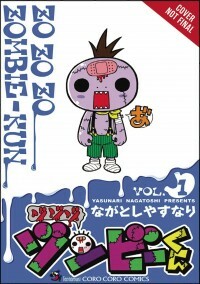 Zombie-kun is completely and utterly a zombie. Blank eyes, vacant mouth with pointy teeth, purple skin, etc. You'd assume he was non-sentient, except that he keeps having adventures that test his intellect (low) and persistence (high). His first one involves trying to buy tomato juice from a vending machine. He checks his pockets for money. No luck. He keeps looking and accidentally disembowels himself, but fortunately this doesn't seem to bother him too much. He remembers that his head is a money box and does something that would be violently fatal for you or me. Even after this, though, the dispenser mysteriously fails to do its job. Zombie-kun sticks his head in an inadvisable place to see what's going on, with inevitable and deformed results. I find it hard to imagine this working as a full-length episode. Zombie-kun's mute (although he has a human friend in ep.2) and his adventures are just light-hearted slapstick with a twist. I don't know how you'd spin this out to half an hour, let alone a series of such episodes. However I was impressed enough that I'm now planning to buy the manga next time I'm back in Japan.